I have written, produced, and directed both feature films and television programming and everything in between and have been honored with over 75 industry awards along the way. To date, I have published five books, four of which are nonfiction. My first novel was chosen as one of the top five finalists in the Next Generation Indie Books Awards. I now write under the pen name R.J. Eastwood. When not writing, I cook Italian having grown up with a Sicilian mother, a wonderful cook who took the time to insure each of her children knew how to prepare a great Italian meal. 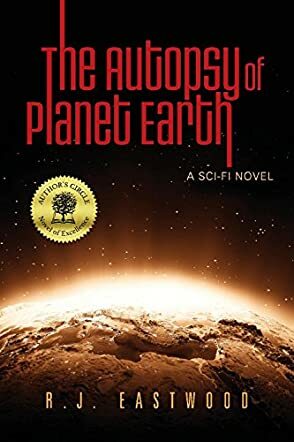 The Autopsy of Planet Earth by R.J. Eastwood is a fast-paced, gripping sci-fi novel with a unique premise, a story that follows the adventure of an alien who may hold the key to save Earth from its slow death. Legna, an extraterrestrial, arrives on Earth with a very curious claim — his race created mankind and then abandoned humans to evolve on their own. Now disheartened at humanity’s slow self-destruction and ignorance, he’s returned to reverse the path and restore them to a way of life that knows peace and harmony. Readers are thrust into a dizzying adventure with the US Chief of Staff, Gabriel Ferro, and Dr. Catherine Blake as they are transported to a world where no human has ever been. Can the alien be for real and is there a way to correct the harm that is already done to Earth and humanity? The answers this book offers will surprise you. This is a sci-fi story with a powerful international setting in the future, introducing readers to strange happenings and to intriguing scientific considerations. R.J. Eastwood creates an array of characters, including anthropologists, scientists, politicians, and researchers, who fit neatly into the narrative. With an intelligent sense of backstory, the author infuses life and humanity into his characters. The plot shows proof of a highly imaginative mind, done with intricacies that create a unique journey for readers. The Autopsy of Planet Earth will appeal to sci-fi fans who enjoy stories involving aliens and space travel. The prose is crisp and the setting breathtaking. R.J. Eastwood’s short chapters and constant shifts in story line create a powerful sense of suspense in readers and keep them turning the pages, eager to discover what comes next. An intelligently plotted and well-written science fiction tale.